Greetings to all who read the BDU Blog! 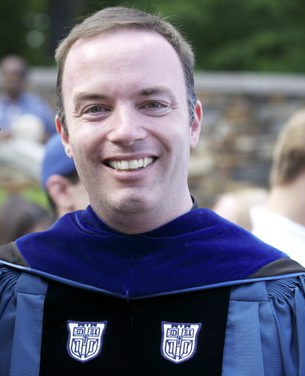 My name is Michael Gustafson, and I am a Duke Alum^3 as well as a faculty member with the Pratt School of Engineering at Duke. I am also an Ally, and have graciously been given the opportunity to talk about what that might mean. This first post is a bit about the start of that journey. I find it a somewhat amazing coincidence that 18 years ago I wrote my first-ever letter-to-the editor (of The Chronicle) entitled “Removing ROTC simply a quick fix.” I was arguing against banning ROTC on campus as a means of effecting change regarding policies barring homosexuality in the military. The coincidence is that my letter was published right about the time that the men and women enlisting in the military today were being born and just a few short years after the birth of Midshipman Pruitt – he of the “Repeal, The Question, and JFK” post published here on September 20th, the day Don’t-ask-don’t-tell expired. As a result, I have thought about what it means to be an ally, as opposed to just seeming like one. In the spring of 1993, the Department of Defense policy in force was from a 1982 directive stating that homosexuality was incompatible with military service. In part because of this policy, several universities had already banned ROTC from campus, and the Arts & Sciences Council at Duke was discussing doing the same. I was a senior in the Naval ROTC program at the time and knew that the officers we worked for and students we served with were not the ones setting the policies. I also knew that ROTC units around the country were being re-sized – generally downward – and I worried that, if the Arts & Sciences Council moved towards a ban, the Department of Defense would waste little time closing Duke’s unit. I and several of my classmates in the program were able to afford Duke primarily because of the scholarships offered through ROTC, and I became concerned that a ban on ROTC would mean (1) that in the future people in my situation would not be able to attend Duke, and (2) that those same people – who perhaps were opposed to the ban as I was – might place the blame and their anger on the people they perceived as having taken away their ability to go to a place like Duke University. I thought the move to support students who were being barred from service might backfire given that none of the policy makers would be affected but potential future policy makers would. As it turns out, the Arts & Sciences Council did not have enough voting members on hand that day and, as far as I can recall, never did change official policy regarding the ROTC units. Looking back now, I believe my letter was neither the worst, nor the best, beginning for an ally. Not the worst beginning, because I – and you as well – can imagine letters far worse than the one I wrote being written about the possibility of an ROTC ban. If not, there are doubtless some soundbites you can glean from the interwebs regarding the repeal of “Don’t Ask Don’t Tell” policy and then timeshift to when under the law of the land it was not just talking about being LGBTQ that was seen as incompatible with military service but actually being LGBTQ. And the letter was not the best beginning, because, frankly, it could be read as saying, “Well, it may be unfair for you as an LGBTQ person to be barred from receiving an ROTC scholarship or serving in the military, but if Duke imposes this ban, I would have to take out loans and stuff to go to Duke or pick one of the other several dozen excellent universities with ROTC programs to earn my commission!” If Chris Perry were still the editor here, I’m pretty sure he would be able to add the helpful #straightguyproblems tag that would well and truly indicate the relative importance of the issues. In stating, “I am personally opposed to the ban, but removing ROTC is not an effective countermeasure,” I was certainly seeming to be an ally – but without actually being one. In fact, I did not even have a concept about what being an ally would mean. Fast forward a few years. I am at a conference with a colleague and several students. Somehow, one of the students and I ended up discussing the harassment that the student had suffered as a result of being gay: the verbal and physical threats. It was the first time that I had been told by anyone directly what they had gone through just for being who they are. It was the first time I realized that such a thing could actually happen at Duke. Long story short, the student had finally come to the realization that the psychologically hellish dichotomy of being at Duke and its relatively more understanding environment followed by being at home and having to be Someone Else needed to be changed, and the way to make that change was to come out. The student’s fear about coming out was that the student’s parents would take away the one thing that had actually been a blessing and a comfort – the connection to Duke and with it the fellow students and faculty and staff who had been supportive and the environment in which a new life of truth had begun. This time I saw a blessedly different side of Duke – one I wanted to be a part of and see grow. As for being disowned - I couldn’t even begin to fathom such a thing. And so I had to start learning what it would mean to actually be an ally. If situations like these had to be dealt with by these two students, there had to be other students in similar struggles. And if someone like me, sheltered as I’ve been from discrimination and prejudice, had somehow still managed to convey an openness to be approached on matters of discrimination based on sexual orientation, there had to be others who had experienced more and learned more than I and who could help me. And, lo and behold, there are! Presumably, you know that. You are, after all, reading this on a blog put together by and for students across the spectra of gender and sexuality. 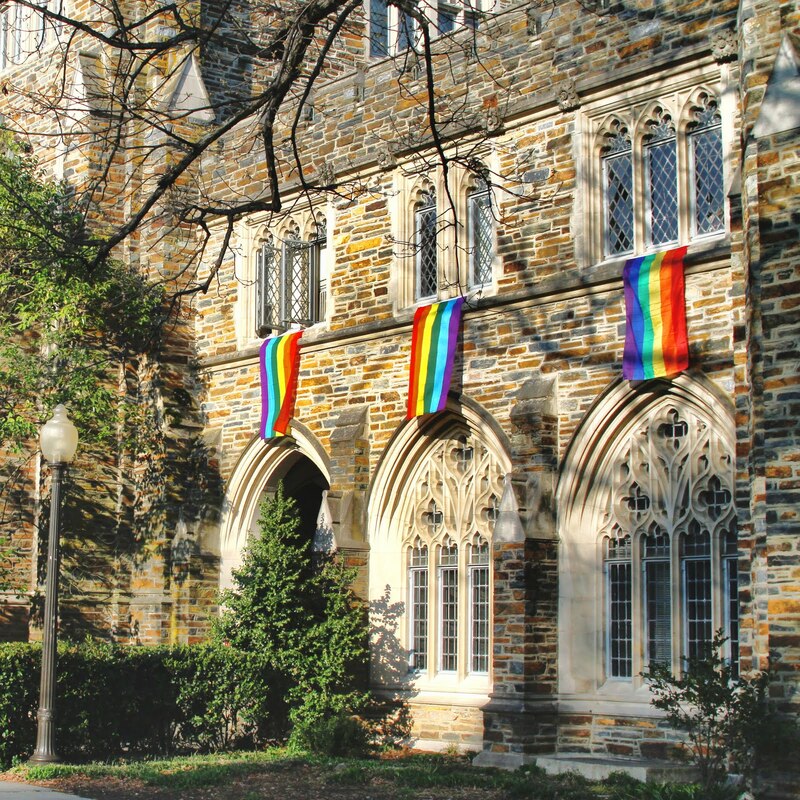 If you have been on Duke’s campus, you have seen the rainbow flags adorning random windows throughout the Gothic Wonderland and know that you are not alone – whoever you are and wherever you find yourselves in those rainbows. Hopefully you know that there is a Center for LGBT Life – and that the people there are ready to answer questions and offer support and all kinds of other things which, if listed, would get me into trouble with my editor for post length. And if you have been by my office, or others on campus, you have hopefully seen the Ally sign members of the Ally Network put up to both show you our support and to mark our space as a safe one for you to be yourself. It is a real privilege to be granted space on this blog – and I hope going forward that I will earn the honor by being an ally rather than merely seeming to be one. This is an absolutely fantastic post...I can't wait to see more from you, Dr. G! It's really inspiring to know that there are people out there who really care about LGBT issues and are willing to offer support and guidance to people who really need it. Also, that is, uh, exactly how I would've commented on your letter-to-the-editor (on Netscape for Windows 3.0. (Also also, I wonder if I could've made The Hashtag a thing 20 years ago.)). And to piggyback off of a previous conversation, I guess the Love=Love mentality is relatively new. I would also like to point out to Everyone that the most jarring experience for you was 1) having someone you know come out to you 2) this person relaying what life's been like and getting a first-hand account. It just wouldn't be as effective if someone were intellectualizing the issue with you. Our experiences and existing relationships are Our most effective weapon against prejudice. Which, for the record, is why This Blog and everyone that's shared on it are so awesome. Awesome post! Can't wait to read more. I know that when I was choosing colleges, the very first thing I looked at was whether or not they had an NROTC unit. The fact that Duke didn't decide to remove ROTC from the curriculum so many years ago made her one of the best schools in the country capable of producing military officers (if we go by US News and Report, I think we actually might be *the* number one school with an on-campus NROTC) and played a huge part in my and many other students' decision to attend Duke. I've personally always seen the act of banning ROTC from campus as a very simplistic and juvenile way to respond to complex issues like DADT and discrimination, and I love that your letter to the editor says just that. Also, I think its really powerful and telling that you were one of the first people your former student turned to after their falling out with their family. That, folks, is what being an Ally is all about. Great post Dr. G! It's great to hear from allies, especially adults. I'm really glad you made the distinction between being a tolerant person and being an ally. Tolerant people are, of course, awesome and the world could always use some more of them, but it isn't quite the same as an Ally. Allies are actually a part of the community, which is why the full acronym is LGBTQA (if I left out a letter, someone please correct me). I have an enormous amount of respect for allies that get involved in the community and stand up for LGBT rights, even though it technically "isn't their fight". Thank you for supporting all of us. See you in class! Dr. G, you are truly inspiring. Thank you for this! It's SO cool to see FACULTY on this blog! Thanks so much for promoting the Ally program too..this could not be a cooler post!! It is great to see a faculty member contributing to this blog. Really gives it an entirely new, all-encompassing feel. Not that I don't love reading other student's posts, but it is nice to hear someone from more of the universityish side talking to you a little bit as well. Love it! Welcome to the blog, Dr. G! I hope to meet you some time. I'm also glad that you were able to be there (even if you felt completely unprepared) for someone when they reached out for help after coming out. @Chris, You would have been using the hashtag before it was cool, without a doubt. Thanks so much for the post, it's awesome to have such a powerful ally as a friend and faculty member!